With enrollment approaching 1,200 students at Ries Elementary School, administrators decided to shift to a blended learning model to meet the needs of all students. Initial planning included discussion of our school’s needs and capabilities along with the roles of students, teachers, administration and the blended learning strategist. Our team developed a three-year plan consisting of an overview of what a blended learning environment would look like, with specific attention paid to budget, infrastructure, hardware distribution and application implementation. We were fortunate to have a strong infrastructure in place that made the transition fairly smooth. The school now has six one-to-one classrooms. The remaining teachers have six to ten devices in their classrooms, as well as access to three computer labs. Hardware consists of iPads and netbooks. We also purchased web-based applications, such as MobyMax, that are designed to create a personalized learning path for each individual student. Since implementing the new blended learning model in the 2014-15 school year, teachers have transitioned from lecturers to facilitators. Teachers who are interested in the blended learning concept have joined our blended learning committee, which meets weekly, to share successes and challenges. They continually look at the data programs to help drive their instruction. With blended learning initiatives in place, teachers have noticed a positive shift in students’ academic performance and attitudes towards learning. Communication and thoughtful planning helped our school successfully incorporate blended learning into lesson plans. 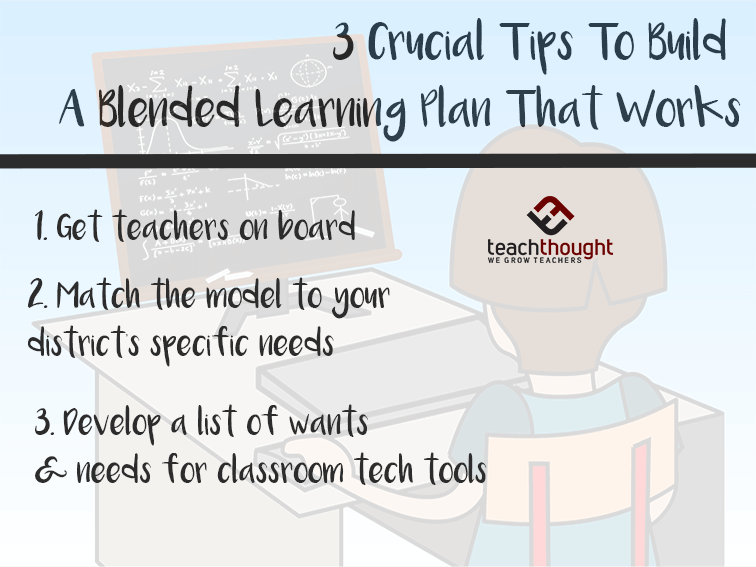 Here are three tips to get your blended learning plan underway. As your school begins to develop a blended learning model, it’s crucial to include teachers in the conversation early on. Getting support from the staff each step of the way will help your district create a plan that teachers are actually invested in. The wealth of knowledge that teachers can provide about their needs in the classroom will also better inform your plan. Professional development should be a part of your blended learning plan. For example, our district provided an introductory blended learning class over the summer. These training sessions increase the staff’s comfort level with using technology in the classroom. Ideally, the professional development would teach staff about the specific tools that will be used in the blended learning plan. Training teachers how best to use and analyze data provided by these tools will ensure that your plan produces results. Blended learning models are not “one-size-fits-all.” Tailor the plan to the district’s needs. As you select a model for a district, school or classroom, your staff should consider class sizes, student needs, teacher needs, available budget and much more. Having a basic understanding of the various classroom models in blended learning will enable you to determine which one is optimal. In a station rotation model, groups of students rotate through various classroom-based learning modalities. Students might alternate between online learning and teacher-led instruction. This model reduces the cost of blended learning and is ideal for collaborative activities among students. Initial planning is important before implementation. With upfront planning and direction, students will learn how to “rotate” through various stations with minimal downtime. In a lab rotation model, students work individually in a computer lab on web-based programs designed to create a personalized learning path for them. Teachers monitor students to make sure they stay on task, but do not provide any intervention at this time. Intervention occurs after the teacher reviews the data to determine where a student is struggling. Scheduling this kind of rotation can be challenging if multiple classrooms have access to only one computer lab. A flipped classroom delivers content and instruction primarily online and can be implemented while students are in school or at home. When in school, this model allows some students to work on a particular lesson while the teacher is providing small group differentiated instruction to others. Time in the classroom is used to practice skills learned online and work on projects. Without traditional lectures during face-to-face learning, flipped classrooms often facilitate more one-on-one time between teacher and student. One challenge that districts run into when implementing a flipped classroom model is ensuring equitable access to hardware and connectivity outside of school. In a one-to-one program, the school provides each student with a laptop, netbook, tablet or other device. The up-front cost for this model is significant. However, many educators argue that the long-term benefits outweigh the initial cost when all students have equal access to technology. Whatever model a teacher chooses to implement, one important caveat must be in place. Students need to become responsible for their learning. By having students track their activity daily on an accountability sheet, they become aware of the skills they are learning. Creating a list of wants and needs can help narrow your search for the perfect tech tools. Items to consider include instructional goals, data privacy, user friendliness, cost and compatibility with existing tools. For our school, one of the top priorities was to find a tool that would personalize learning for each student in our rapidly growing school. We ended up choosing MobyMax as a curricular tool because it quickly identifies students’ skill gaps and automatically assigns lessons based on their individual needs. MobyMax’s low cost was another factor because it met our budgetary needs. Comparing blended learning products becomes much easier if you keep track of checklists for each tool. With this planning strategy, you can avoid making an expensive investment in a product that doesn’t work for your school. Janice Heffernan is a blended learning strategist at Aldeane Comito Ries Elementary School in Las Vegas.